Started around 1950 in New York City by Arthur Pepper, ART runs a wide gamut of styling and often resembles Florenza. It is unknown by this writer whether Mr. Pepper and the Kasoff family were related in any business manner. Widely sold in the US in department stores, this originally inexpensive line was well made and the designs were creative not only conceptually but in their use of components as well. 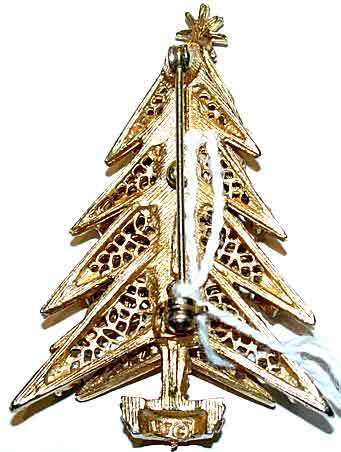 It is particularly sought after by Christmas jewelry collectors for their Christmas trees, boots, wreaths, candles, angels and bell brooches. 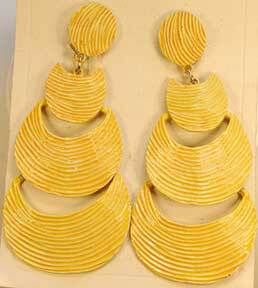 Description: ART Sabrina Translucent Leaves Earrings - The ART company was not particularly known for using the translucent leaf stones, certainly not in the way that Lisner was. In fact, this is the first time I've had a piece of ART with this type of stone, and I had no luck finding other similar pieces online, either. These leaves are beautiful, a kind of lavender blue shot with a streak of pink; enameled leaves in light pink surround, and three sizes of pink AB rhinestones accent. 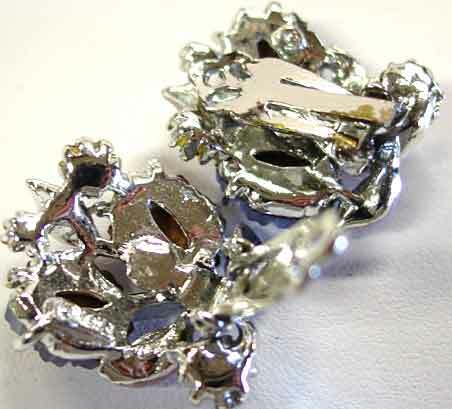 All set in silvertone, the earrings are clip, 1" x 7/8". 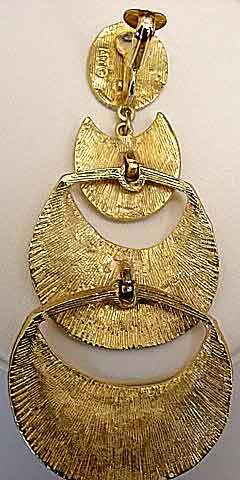 Only one earring is signed (with ©), which may account for the difficulty of finding matching pieces - they may not be signed. 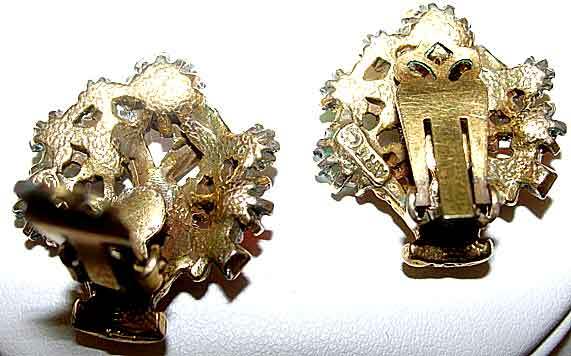 Very slight plate flaking on the earring findings; the earrings themselves are fine. The pink AB stones may have gotten a little "orange-y" with age, as is typical of pink rhinestones, but it is minor and could easily be replaced with new ones if that bothers you. These are unusual to say the least, and these are bargain priced. 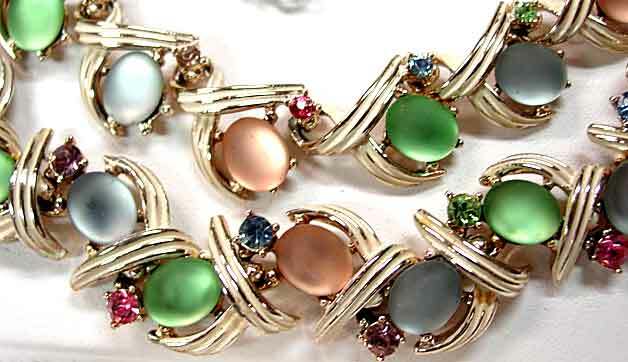 Description: ART Frosted Pastel Cabochon Necklace and Bracelet Set -This has cabs, enamel, colored rhinestones - the works! Frosted cabs in light blue, mint green, and peach, are accented with colored rhinestones in pink, light blue, lavender, and peridot. 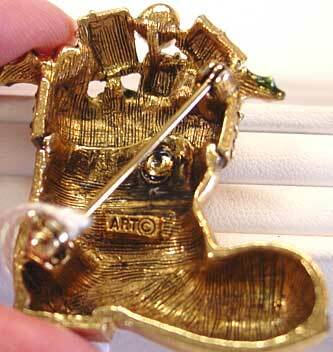 Cream enamel on light goldtone shows little if any wear. 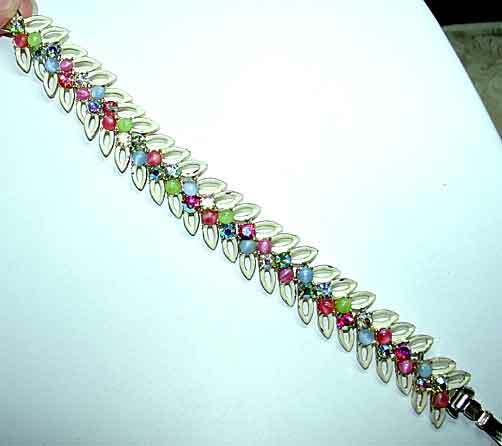 Adjustable choker extends to a maximum of 16"; bracelet has a foldover clasp, 7" x 3/4". Extension chain on necklace looks to be original but has discolored to a darkened brass over time. I am also including the matching earrings as a freebie, because they are missing a few of the cabochons, which are probably not replaceable, so you might want them for spare stones. 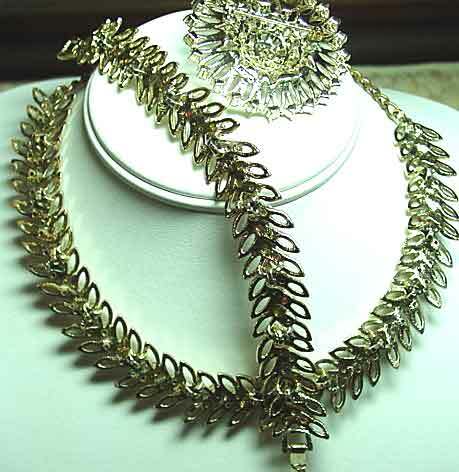 Necklace and bracelet are in very good/excellent condition with extension chain issue as noted. 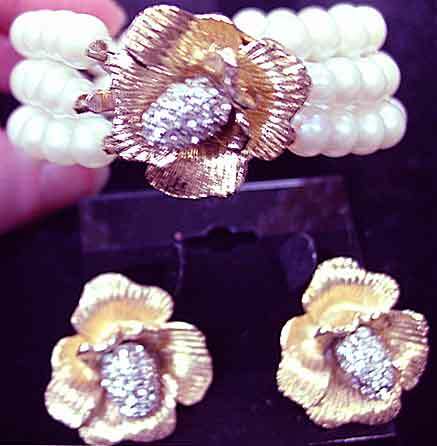 Description: ART Triple Strand Glass Pearl Bracelet with Fancy Clasp/Matching Earrings - One of the interesting things about ART is that it doesn't seem to have a particular "look" and it's offerings really ran the gamut. 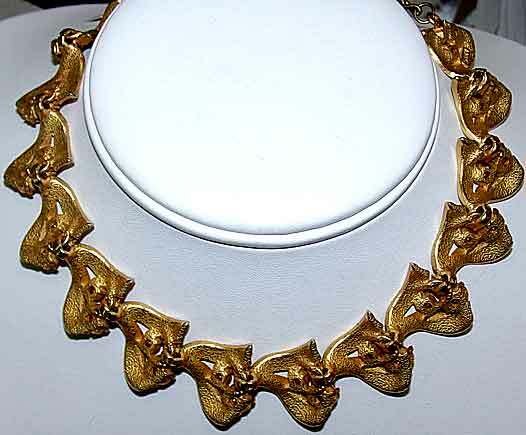 This elegant, probably 1960's set is of very nice quality with 3-dimensional goldtone metal florals centered with a paved silvertone "cone", with the bracelet echoing the earrings in the clasp. Three strands of glass pearls are held in place by goldtone metal sections. 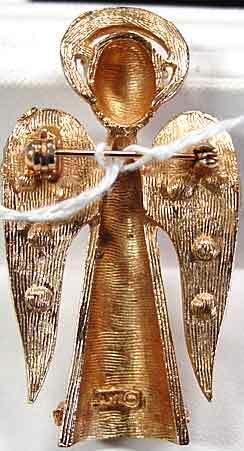 The earrings are clip, about 1 1/8" in diameter, with the ART and © on the earring body rather than on the clip finding. 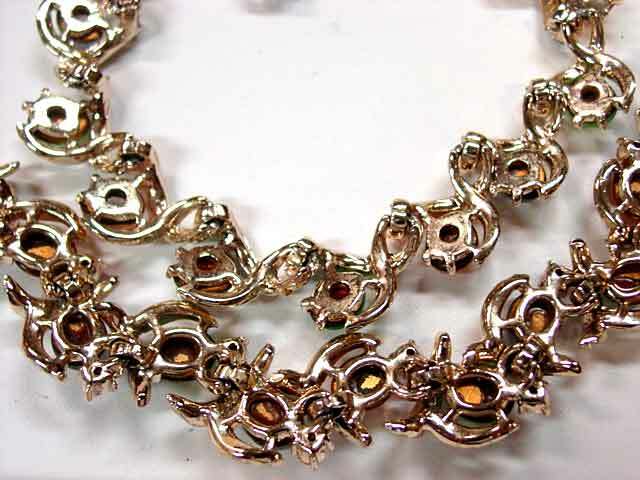 The bracelet is unmarked, with the fancy clasp hiding the push-in tongue, about 7 1/4" x approx. 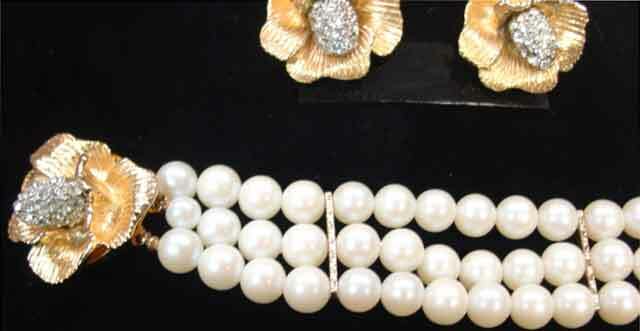 1" wide, however, because of the diameter of the pearls, this will probably only fit an under 7" wrist. Excellent condition, perfect for any occasion where you want to channel an elegant feel. 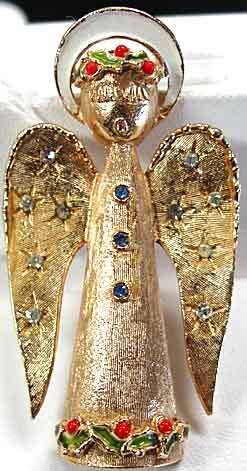 Description: ART Christmas Angel with Enamel, Beads and Rhinestones - Angel pins seem much less common than Christmas tree pins, and this is one of the nicer vintage angel pin designs. This actually seems to have been done in three versions - this one, an identical one that uses red rhinestones instead of the cherry red beads, and one with the same body but different wings that have no rhinestones. This is my favorite of the three, with green and white enameling, the cherry red beads for holly berries, and blue enamel rhinestone buttons and clear rhinestones on the wings. The two innermost clear rhinestones have darkened somewhat with time, but the rest of the piece is in excellent condition. Body is curved, about 2 1/8" x 1 1/4". 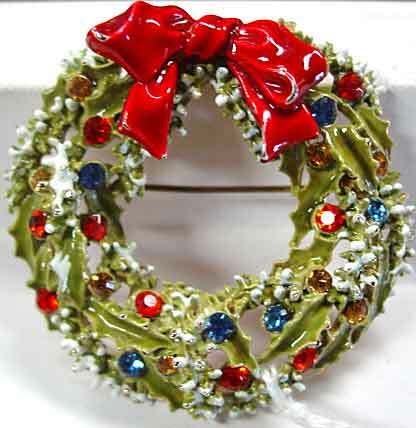 Description: ART Christmas Wreath with Enamel and Rhinestones - On the ART page you can see two others of this design, one non-enameled, and one like this, except that this seems to have more white enamel "snow" than the other two. Excellent condition, all stones original. The tiny amount of enamel loss that you can see in this greatly magnified photo is almost unseen in person. 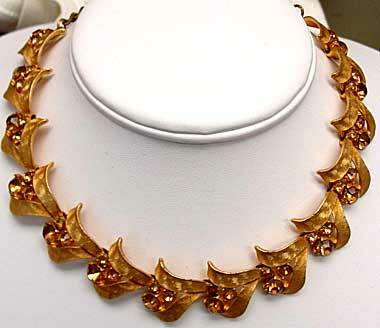 The topaz rhinestones are all "golden" in person and not brown. A classic. 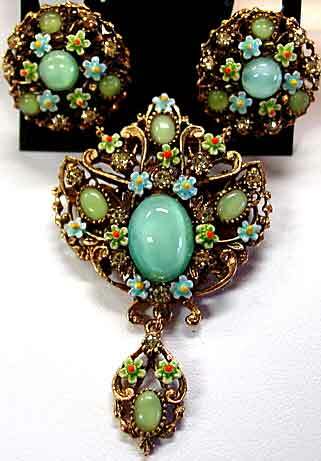 Description: ART Floral Motif Brooch and Earrings - Charming dangling brooch and matching button style earrings feature tiny enameled flowers in aqua and lime green with yellow and orange centers, small jonquil yellow rhinestones and round and oval cabochons in light green and aqua. 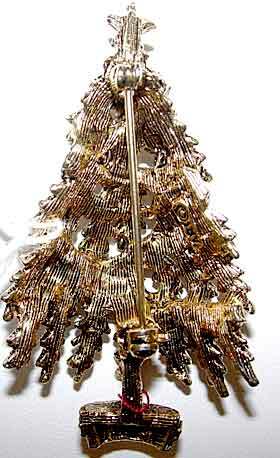 Goldtone plating, all stones paste set. 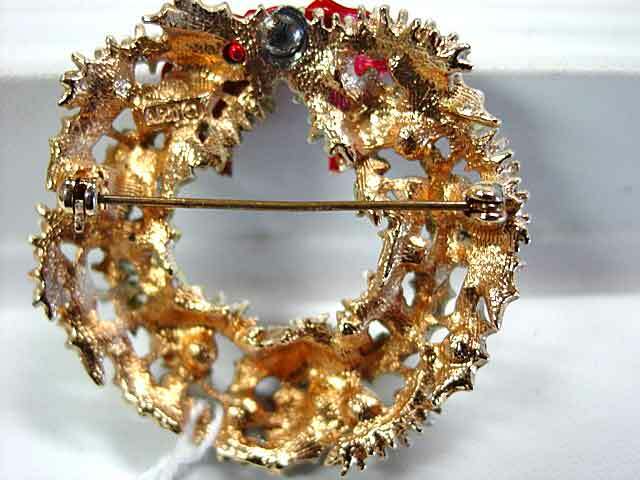 Brooch is slightly under 2 1/2" x 1 1/2", earrings are 7/8" in diameter. Excellent condition, I see no flaws here. 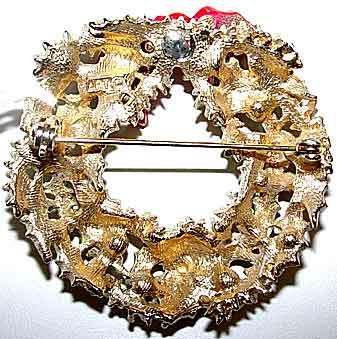 Description: ART Christmas Wreath Brooch - I believe this is the goldtone, rather than olive green enamel, version of SP12-462. 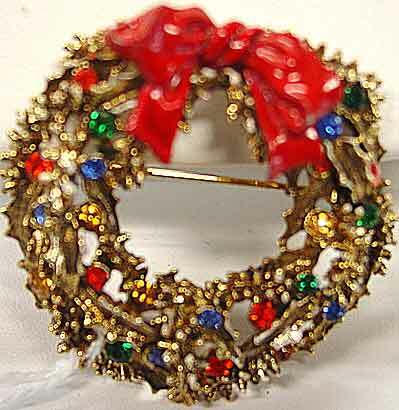 Red enamel bow with tiny spots of white enamel throughout the rest of the piece for snow, and dotted with hyacinth, topaz, sapphire blue and emerald green rhinestone "decorations". About 1 3/4" in diameter. Excellent condition. 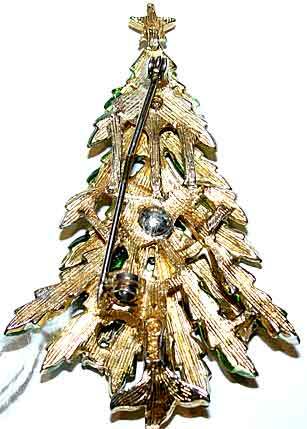 Description: ART Christmas Boot Brooch - As much as I like Christmas tree pins, I think some of the non-tree pieces have a lot of personality and charm, and this piece certainly fills that description. 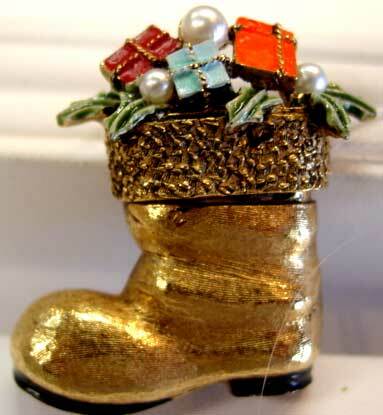 Goldtone boot has black, orange, light blue, red and green enameling and small white glass pearls, with leaves and gifts spilling out of the top of the boot. About 1 5/8" x 1 1/4". Other than a small factory bubble in the enameling on the orange package it is in like new condition. 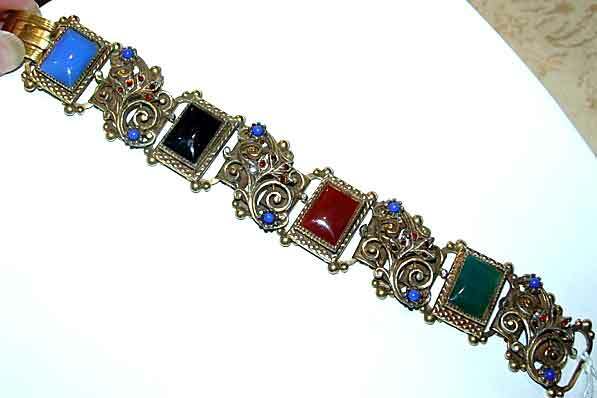 Description: Art Rectangular Cabochon Bracelet - Done in faux lapis, faux onyx, faux carnelian and faux jade, this is accented with faux lapis ballotini and tiny red rhinestones. Marked "ART" with a copyright symbol on four links! this has a wearable length of 7 1/8" and is 7/8" wide. The rectangular cabs are not common. 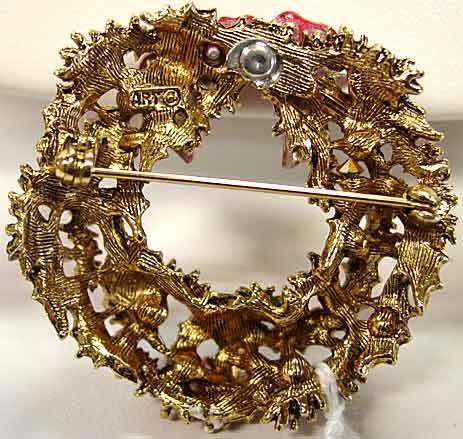 A really interesting piece, excellent condition, with missing stones replaced. 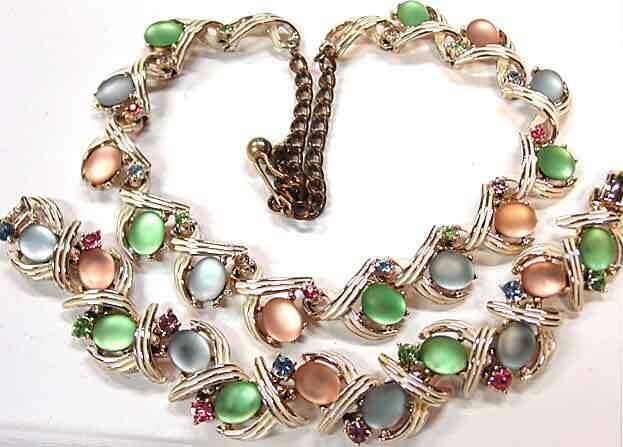 Description: ART Necklace, Bracelet and Brooch Demi - Fabulous 1950's demi has cream enamel, lime, rose and light blue faux moonstones, and lots of pastel colored aurora borealis rhinestones. 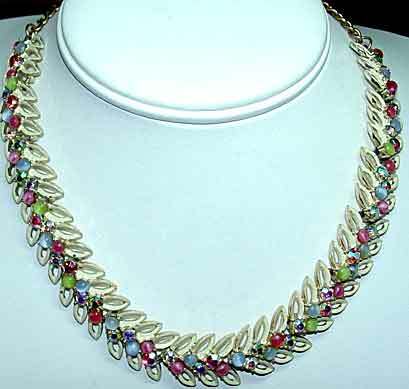 Necklace is adjustable to 16", bracelet is standard 7" and brooch is about 2" in diameter. 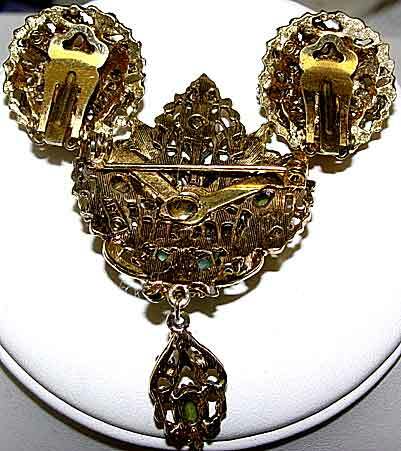 Enameling is in excellent shape on necklace and bracelet, brooch is very good but not quite as good as the other two pieces. I have replaced a few missing faux moonstones and repaired the clasp on the brooch, but amazingly ALL the original rhinestones were there. Finding demis is becoming increasingly difficult, snap this one up! 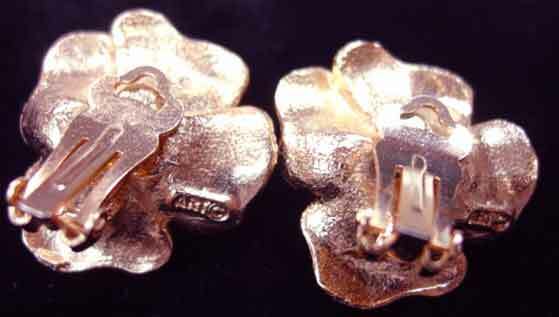 Description: ART Flowerbasket Earrings - All original and in excellent condition, these are sure to please the flowerbasket collector (in all my years of collecting, this is the first time I have seen basket earrings.) 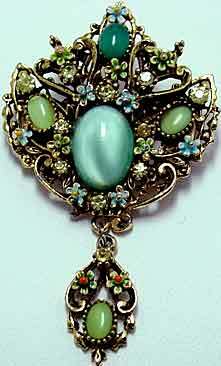 Done in autumn colors of lime green, hyacinth and hyacinth aurora borealis and accented with small white faux pearls, goldtone setting, clip mechanism. About 1" in diameter. 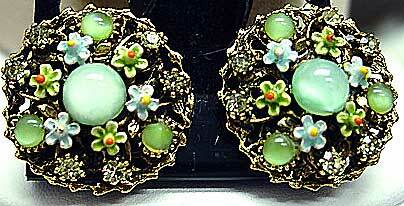 Description: ART Pin and Earrings Set with Aqua and Lime Faux Moonstone Cabochons - Set in light goldtone, with enameling in lime, aqua, orange and yellow, and jonquil rhinestone accents. 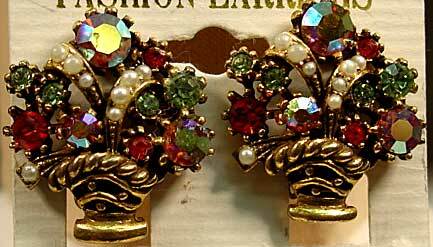 Clip earrings are in excellent condition, 7/8" in diameter. 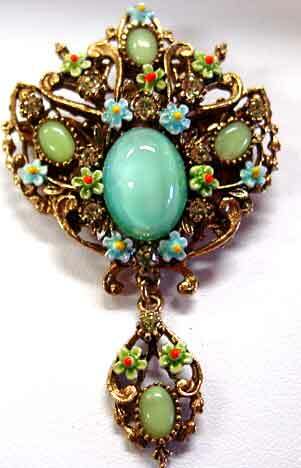 Brooch is missing one curlique above the dangle portion; enamel is a little more worn; measures 2 1/4" x 1 3/8". So feminine and dainty they make you feel like spring all year long! 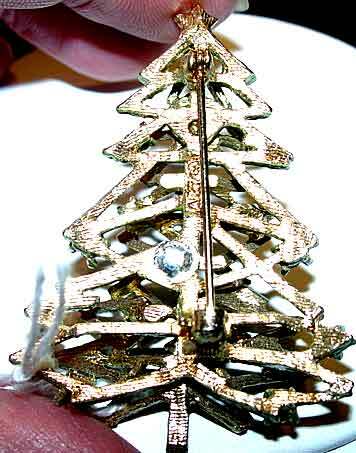 Description: ART "Garland" Christmas Tree Pin - This ART tree is shown in Morrison, Gallina and Trowbridge, and has been nickednamed the "garland" tree, and apparently came in both this version and one with olive green enamel under the "snow". 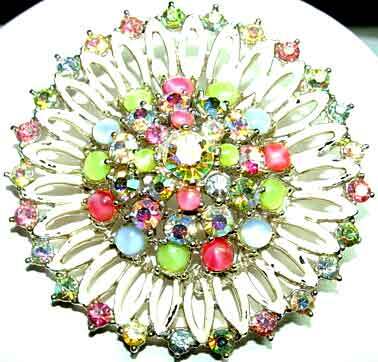 Typical rhinestone colors of hyacinth, amber, emerald and cobalt. Excellent condition - one green stones seems a little large but I can find no evidence that it is a replacement. 2 1/8" x 1 1/8". Signed ART with copyright symbol on the back of the tree base. 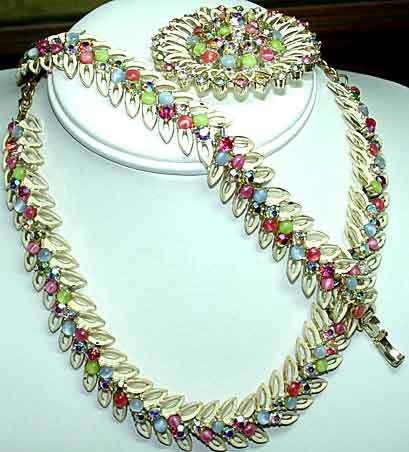 Description: ART Link-style Necklace with Colorado Topaz Rhinestones - Goldtone, adjustable hook necklace will fit up to a 16" neck. Nice with either casual or dress clothes and great with the brown clothing that is currently popular. Excellent original condition. 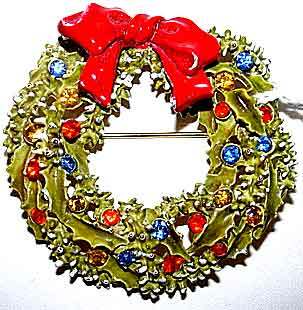 Description: ART Christmas Wreath Brooch - A popular design for ART, this features olive green enamel topped with white enamel "snow" and accented with orange, topaz, and blue rhinestones, all topped with a red enamel bow. 1 3/4" in diameter, signed ART with copyright symbol. Excellent original condition. 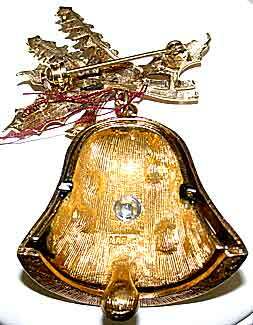 Description: ART Christmas Bell Pin - I have been lucky enough to obtain another of these bells in excellent original condition. 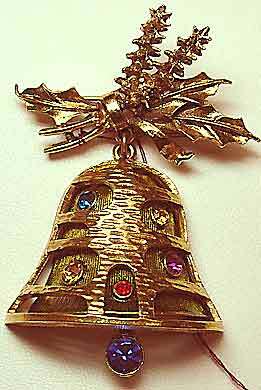 Goldtone with olive green translucent enamel, set with capri blue, light siam, fuchsia and light topaz glass rhinestones with a dark blue rhinestone for the "clapper". Dangle style, 2 1/8" x 1 1/2". I can find no flaw in this piece. Signed ART with a copyright symbol on both the upper and lower parts. 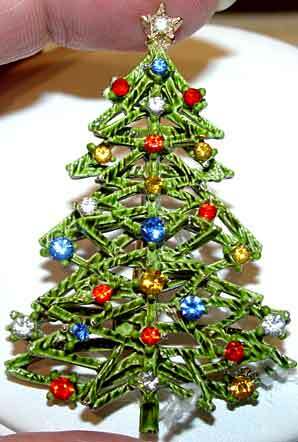 Description: ART Cut Out Christmas Tree Pin with Multi Rhinestones - This particular ART design was done in both an enameled and non-enameled version (see Morrison book for non-enameled version) and uses the usual sapphire-topaz-hyacinth rhinestone combination that was standard for this company. There are some clear rhinestones here that may or may not be original; if you would like us to replace them, we can do it, but this was as found. 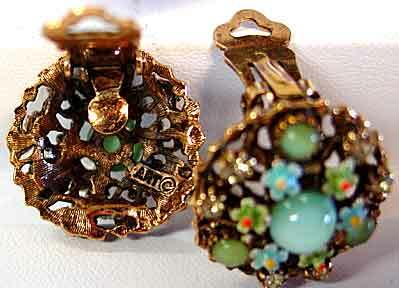 2 1/4" x 1 1/2", layered openwork design has olive colored enameling, goldtone. 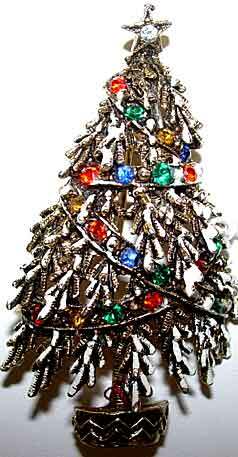 Description: ART Candle Christmas Tree - Shown in Trowbridge, Gallina 2nd edition, and Morrison, this uses a two layered design very similar to the one above, but fills it in with filigree and accents with multicolored "balls" in blue, green, topaz, clear and orange, with clear baguette "candles". The clears in this piece showing aging, otherwise excellent condition. 2" x 1 1/2". 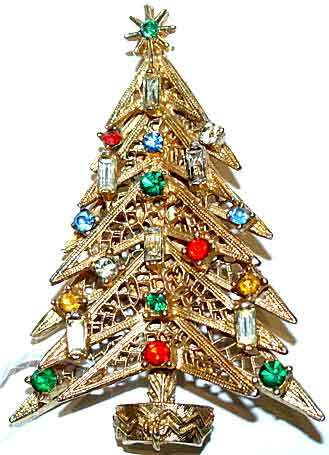 Description: ART Enameled Christmas Tree Pin with Multi Rhinestones - Another book piece, this is shown enameled in Trobridge and non-enameled in Morrison. 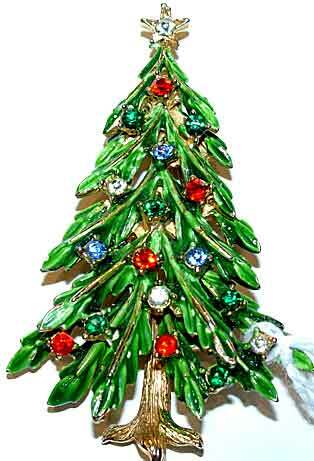 Interesting "claw" design for trunk, enameled branches reach down with the usual accents of hyacinth, blue, green and clear rhinestones. 2 3/8" x 1 1/2", double layered design. Enameling has worn a little at high points but in general is in good shape. Otherwise excellent.